Global temperature records show a statistically significant warming in the last century, with most of the change attributed to anthropogenically emitted greenhouse gases and associated climate feedbacks (Fig. 1). 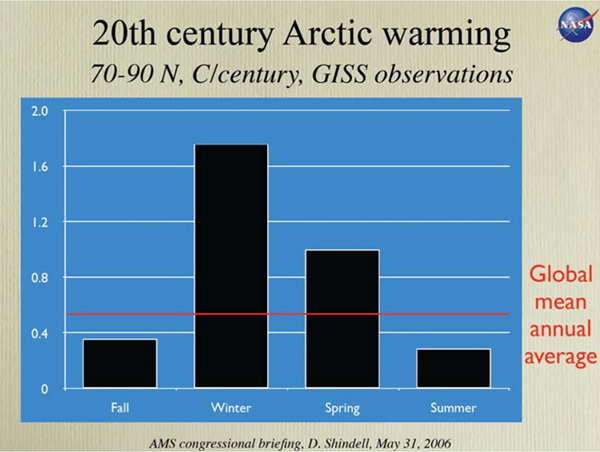 Temperature increases in the Arctic exceed the global annual average (Fig. 2), with maximum warming occurring in winter and spring. Figure 1. 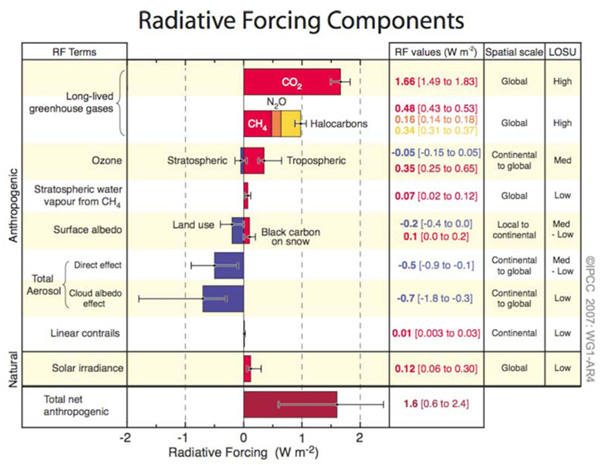 Global-average radiative forcing (RF) estimates and ranges in 2005 for anthropogenic forcing agents, the typical geographical extent of these forcings, and the level of scientific understanding, LOSU (Intergovernmental Panel on Climate Change, 2007). Figure 2. Seasonally separated measured rate of change of 2-m atmospheric temperatures from 70-90 oN and the global mean change (horizontal line). From Shindell et al., 2006. Closely linked to the observed and modeled warming is an observed decrease in seasonal Arctic sea ice coverage and thickness. The minimum summertime extent of sea ice is decreasing significantly (Fig. 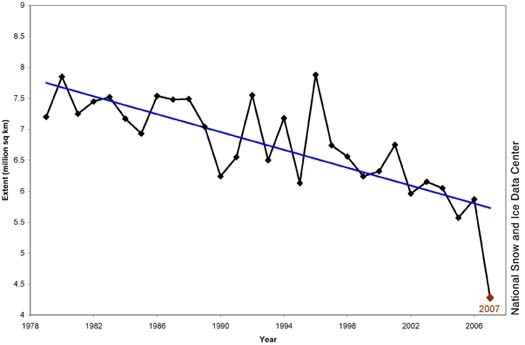 3), and this reduction now clearly exceeds that expected from natural oceanographic and meteorological oscillations (Johannessen et al., 2004; Francis and Hunter, 2006). Some models predict a fully ice-free summertime Arctic Ocean (Winton, 2006), with attendant disruptions to Arctic ecosystems, ocean circulation, and global climate. However, modeling of the Arctic climate system is difficult due to complex and sensitive feedbacks (Serreze and Francis, 2006a,b) and many climate simulations struggle to replicate historical precipitation, cloudiness, and sea ice properties (Walsh et al., 2002). Simulations of future climates result in substantial model-to-model variability in Arctic climate parameters such as sea ice extent and thickness, indicating that some important processes are not being adequately described or simply are not included in the simulations (Winton, 2006). Figure 3. September anomalies of the area of minimum extent of Arctic sea ice from 1979 to 2007. Thin straight line is least-squares linear fit. Courtesy of National Snow and Ice Data Center, Boulder, CO.
direct radiative effects of tropospheric ozone in the Arctic (Mickley et al., 1999; Hansen et al., 2005). During the International Polar Year of 2008, NOAA will engage in an airborne field measurement campaign targeted at improving understanding of these four climate-relevant processes. This effort will be focused on direct measurements of properties and processes that can be used to reduce uncertainty in radiation and climate models. The measurements will be made in the Alaskan Arctic to closely coordinate with remote-sensing and in situ observations planned for aircraft and ground sites in the vicinity of Barrow, Alaska.